From cooling and dust suppression to beneficiation (the treatment of raw material to improve physical or chemical properties especially in preparation for smelting) and concentration, sustainable water use is essential to copper miners as market demands grow while ore bodies decline at projects across the industry. Water impacts, real or imagined, can generate conflicts with communities and environmental groups. Disputes may escalate into civil unrest and lead to harsh regulations and incalculable financial losses. Current flashpoints span mining jurisdictions worldwide. Smart water use is also a pillar of the United Nations-led Sustainable Development Goals (SDGs) and core to the strategy of the Copper Alliance® and its members, including BHP that aims to eliminate all freshwater use in Chile by 2030. Amid some of the planet’s highest altitudes and driest geographies—and most prolific red metal mines—this is no small feat. Last month, BHP took a giant leap forward with the inauguration of the Minera Escondida mine’s second seawater desalinization plant (EWS), making history in the process. The installation, with its 2,500 l/s processing capacity, is the largest such facility in the Southern Hemisphere. The new installation, complementing Escondida’s existing 525-l/s plant that has been running since 2006, is the legacy of a pioneering journey. Construction began in 2013 and represents the culmination of an investment of $3.4 billion, 45 million employee hours and untold ingenuity. Additionally, it represents a major milestone as the world’s top miner seeks to reduce aquifer dependence across its operations. High in the Andes mountains, the logistical prowess behind the EWS is as extreme as the desert surrounding it, which is one of the planet’s highest locations—barely receiving a millimeter of rainfall in any given year. pumping stations and two one meter (42 inch) pipelines to transport the process water from Puerto Coloso to Minera Escondida’s installations 180 km (112 miles) away, and 3,200 meters (10,499 feet) above sea level. With nine high-pressure pumps, each station comprises a 4,000 m3 transfer tank. A reservoir with a 500,000 m3 capacity also was built at the mine, guaranteeing an uninterrupted supply of water. The EWS brings innovation to all three phases of the project cycle. First, seawater is withdrawn by a system deploying two tunnels, boasting a full capacity of 8,000 l/s. Three self-cleaning screens effectively remove any specific impurity exceeding 3 mm. Next, seawater is pumped for a fine-cleaning procedure. This pre-treatment system ensures the quality needed for reverse osmosis (RO) membranes through 120 high-pressure, dual-layer filters containing sand and anthracite to capture smaller impurities. Sulphuric acid then is added to regulate pH, along with ferric chloride for coagulation and a dispersant. Lastly, by the RO stage, the seawater is fully treated to flow through a semi-permeable membrane that, in turn, permits the further passage of the water, trapping salts. This phase enables the plant to reject the RO-processed water, return it to the ocean and yield its final product, known as permeate water. The simultaneous operation of three concentrators—unprecedented in modern mining—is facilitated by high-voltage electricity transmission lines and transformer yards, powered by the Kelar gas-fired plant. Originally approved by Chilean environmental officials as a coal-fired facility, BHP instead opted for a clean electricity approach, transforming the unit into a combined-cycle natural gas complex. With the EWS, BHP is driving a steadily growing trend in the world’s greatest copper-producing nation. 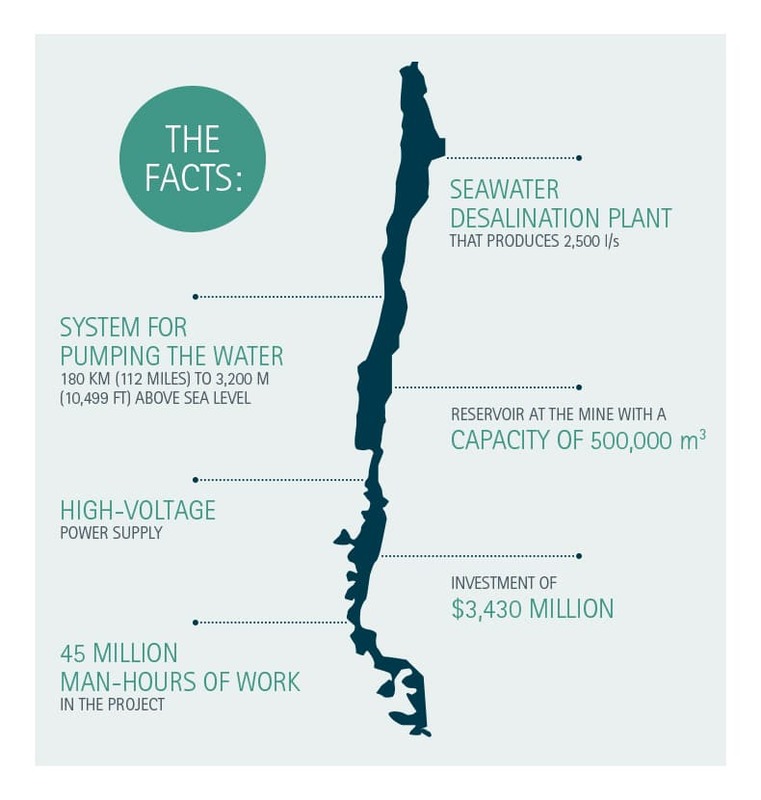 Cochilco, the state copper commission that welcomed the project, predicts desalination will provide half the water demand of Chile’s copper miners by 2026. Operated by BHP with 57.5 percent ownership, Minera Escondida is one of the world’s biggest copper mines and co-owned by Rio Tinto (30%), JECO Corp. (10%) and JECO 2 Ltd. (2.5%); BHP, formerly BHP Billiton, is the world’s largest diversified miner headquartered in Melbourne, Australia.